My strep throat is pretty much gone. Now I just have to remember to take the rest of the medicine. It's much easier to remember when the pain keeps reminding me. I woke up with a bad headache today and took Axert, Zofran and Aleve and went back to bed. I felt fine the next time I woke up. It rained around much of Austin yesterday, but not out at the land. I was driving out there as the storm was blowing in. There wind was fierce and there was lightning quite close by. I was so nervous about the lightning while I was unlocking the chain that I left my keys in the lock and had to run back over to the chain to get them. I didn't bother to lock the chain behind me. I waited until the lightning was far away. I sat in the truck, which I had parked away from any trees that might blow over on it. But then I moved the truck a little closer to one of the big pecans so I could see the lightning better. In a few minutes the storm was gone without giving me even a drop of rain. Ah well. 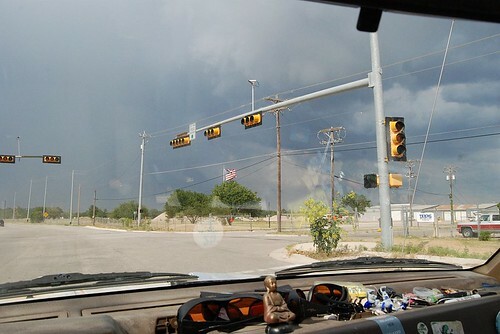 Here's a picture of the storm from US 290 as I was driving toward the land. It would have been nice to get some of that rain. After the storm was gone, I schlepped water and such and then just wandered and enjoyed until I heard some voices and music. I walked down the road trying to locate the source when I saw a cop. He was one I've dealt with before and he is nice (they have all been nice). He headed off to look for the trespassers, and I went back to the truck because it was time to meet curculio for dinner. But as I was leaving the land I encountered four vehicles of people heading down the road toward the land. They said they were going fishing. I told them they couldn't fish there and three vehicles turned around and went down the other road. The driver of the fourth vehicle started arguing with me that there were no private property signs, so they could go there if they wanted (the other people's land has no signs, but you can't get to the river from there). I told him that I was telling him that it was private property and once he was so notified he couldn't go there without committing trespass. He knew that I also had photographs of their license plates. Mr. Argumentative backed down. He drove off to find his buddies and I drove back to the land and canceled my dinner date. Then I called 3-1-1 and reported the encounter. The dispatcher took the plate numbers of the vehicles and some cops came by including the guy from earlier. They checked the area and didn't find anyone. I laid in wait until dark, but no one came by. When I left, there was a cop guarding the end of the road. That cop rocks! I'm sad that I missed my dinner. And I'm not sure about tonight because the bad guys tend to show up a dusk. These guys reminded me of the group of vehicles that showed up a couple of days before the house was stripped so I'm feeling a bit paranoid. I believe they come at dusk, so I'll be heading out there soon. But I want to go out to dinner tonight and if I stay until dark it will be too late for that. We may just have a picnic out at the land, but the plan was that curculio would be taking me out for an early birthday dinner and I was really looking forward to it. I'd picked out a restaurant and everything. On the (rent) home front, G just got Rock Band for the Wii as a delayed graduation present and he's having fun with it. And curculio gave me a really cool hard drive for my birthday. This one will be for backup, an important task that I have ignored so far.